Overhead crane also called bridge crane. The overhead crane is hung in the shop, warehouse and construction plant for lifting the cargos.the bridge of the overhead crane is laying of the tracks on both sides for the vertical run, can take the advantages of the space below the bridge to lifting the material. 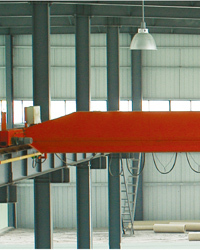 The overhead crane is the most widely used and the largest number of a crane. It is suitable for using in industrial and mining enterprises,steel industry, ports and logistics and other departments and working places. Overhead cranes are lifting devices to move heavy cargo across the top of a working bay either in the shipping industry or in a factory environment. 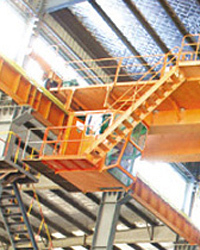 Overhead cranes are commonly used in the refinement of steel and other metals such as copper and aluminum. At every step of the manufacturing process, until it leaves a factory as a finished product, metal is handled by an overhead crane. Raw materials are poured into a furnace by crane, hot metal is then rolled to specific thickness and tempered or annealed, and then stored by an overhead crane for cooling, the finished coils are lifted and loaded onto trucks and trains by overhead crane, and the fabricator or stamper uses an overhead crane to handle the steel in his factory. 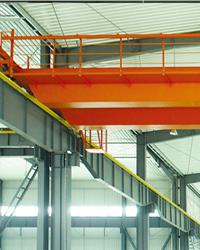 The automobile industry uses overhead cranes to handle raw materials. Smaller workstation cranes, such as jib cranes or gantry cranes, handle lighter loads in a work area, such as CNC mill or saw. - A Knowledgeable support team. 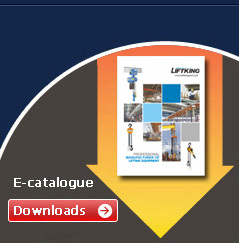 - Information and crane drawings for building design and/or current layout.